I (Matt) came into the lab on Sunday to get some work done and brought along the new digital camera. It's been a while since people got a current glimpse of where we work. 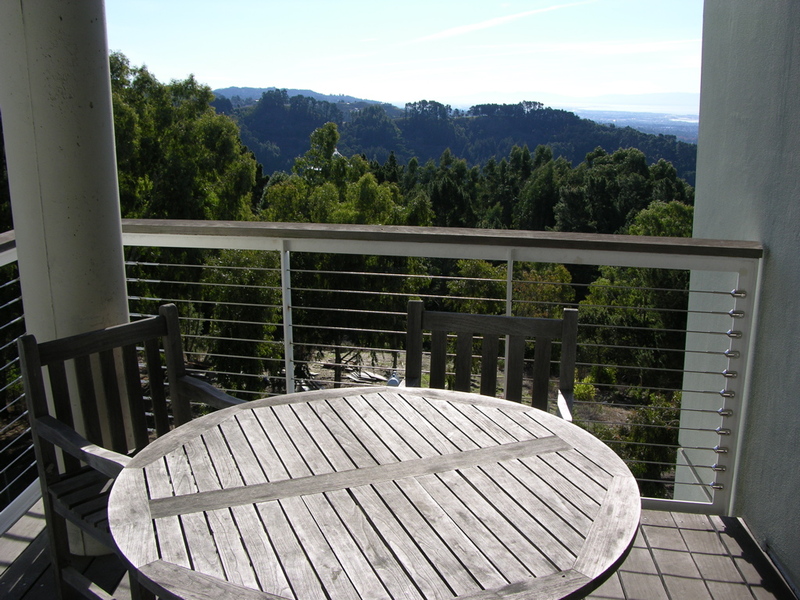 It was a beautiful day, so before entering the building I stepped on the back patio to get a glimpse of the view. 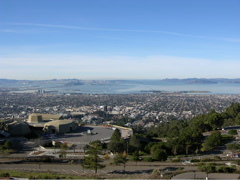 That's the Lawrence Hall of Science directly below me, and then Berkeley/Oakland below that. 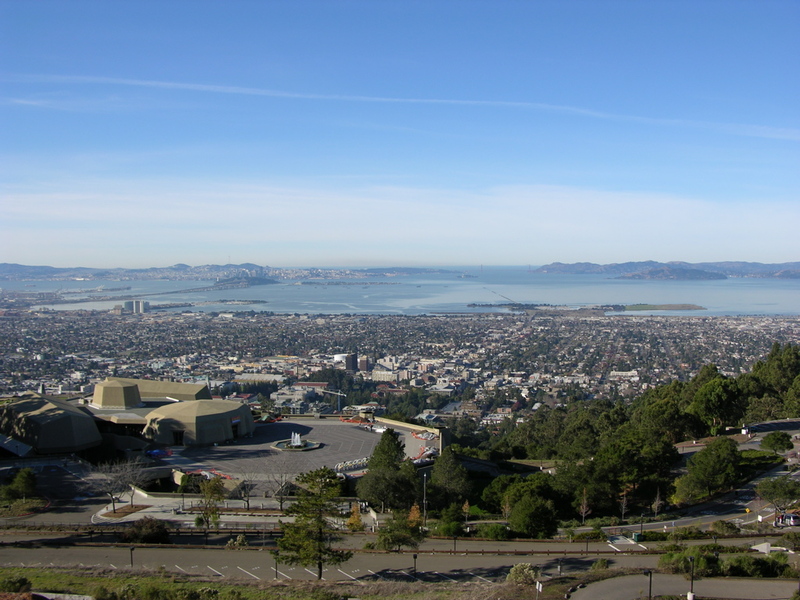 Beyond that is the bay, with the Bay Bridge leading to San Francisco, and the Golden Gate right on the horizon between SF and the Marin Headlands. Pretty good view, no? 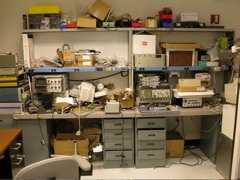 Here's my desk in the lab. Most of us occupy this room - currently Bob, Court, Jeff, David, me and Josh all have desks in here. My desktop is a Sun Ultra 10 with a flatscreen (nice). On the adjacent table is a PC running Windows 98 for those rare occasions I need to open a Microsoft Office document. 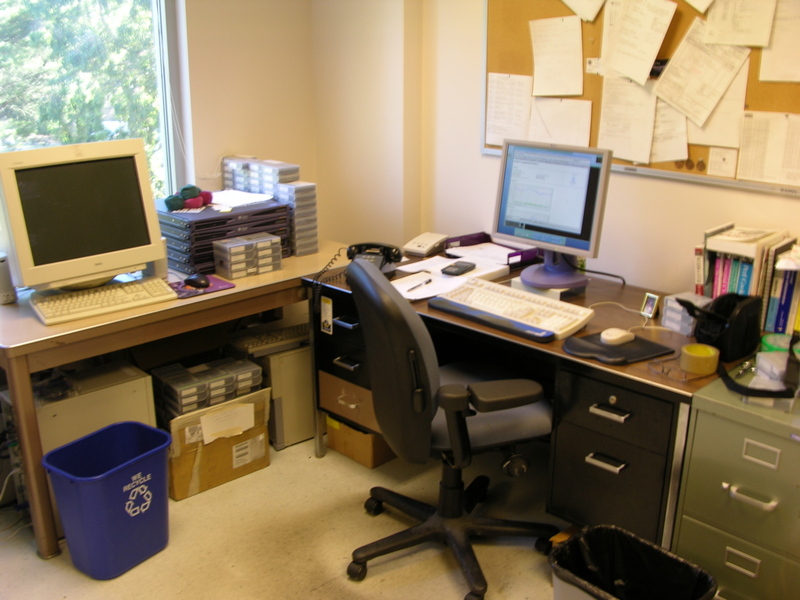 That PC used to be the main Windows build machine for SETI@home classic. There are a pile of unused SunFire V100s next to that (only one has RAM in it). The juggling beanbags on those are actually Jeff's, though we all know how to juggle around here. The DLT tapes in random piles are SETI@home raw data tapes in varying states of splitting, depending on the pile. The picture is blurry. Still learning how to use my camera. This is the right side of my desk. 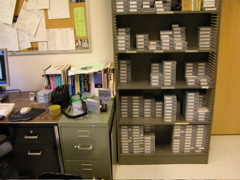 The DLT tapes are mostly network/database backup tapes, except for the bottom shelf - these hundred or so are the remaining SETI@home raw data tapes to be split into workunits. 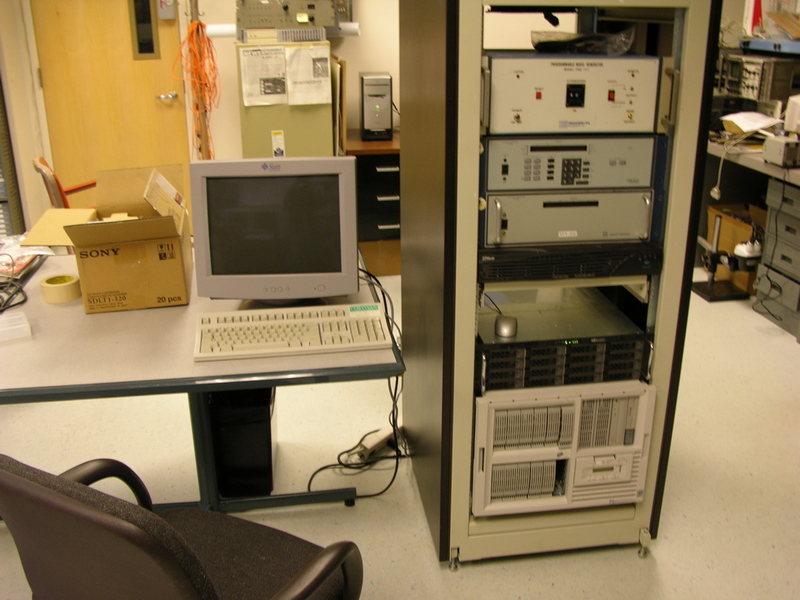 In the center of the lab is this rack housing a bunch of unused test equipment and an incredibly noisy dual opteron server (to be used by the SETHI project). Court is setting that server up and soon we'll throw it in the server closet. 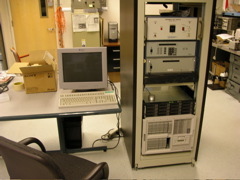 Note the hatrack towards the back used for fibre cable storage. The door leads to another lab where they analyze moon rocks. 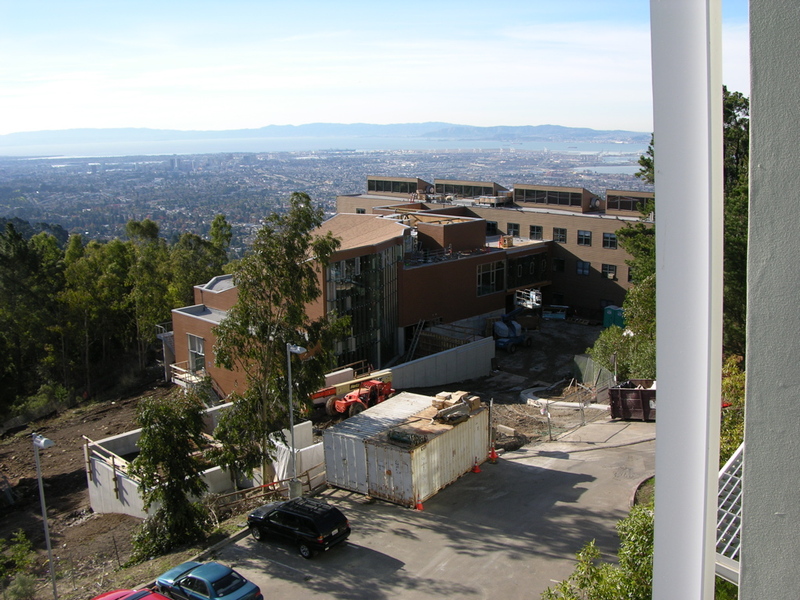 Here's where Dan and company used to build our SERENDIP data collection hardware. 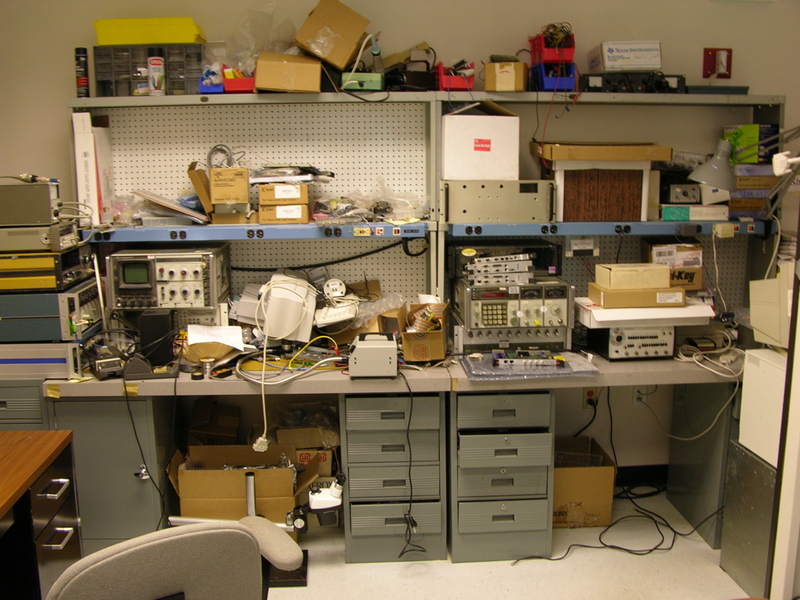 Since they have taken to working in nicer facilities down at the Berkeley Wireless Research Center, these lab benches have fallen victim to entropy. Actually, some work still gets done up here, believe it or not. We also occupy a nearby half-lab, which isn't as human-friendly (due to noise and spatial constraints). Among other things in this lab is the new data recorder (attached to a bunch of test equipment). This is Jeff's baby. Once it's finished we'll collect fresh data from Arecibo again. 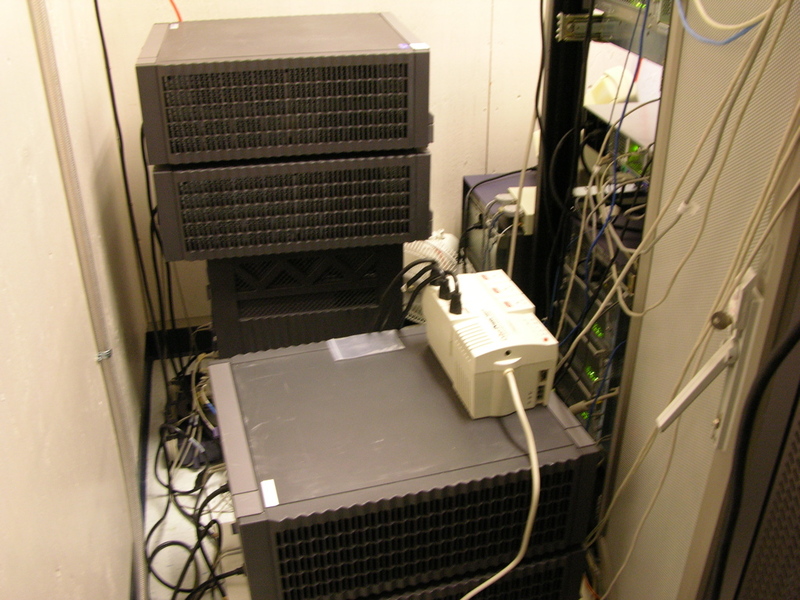 Here is the temporarily displaced BOINC upload/download server. It's a Sun E3500 with a half terabyte of fibre-attached storage sitting on top of it. We'd put it in the closet, but there just isn't any room in there. When SETI@home Classic shuts down, we'll make room. Here's another E3500 with 2 terabytes of storage. This is the master science database. 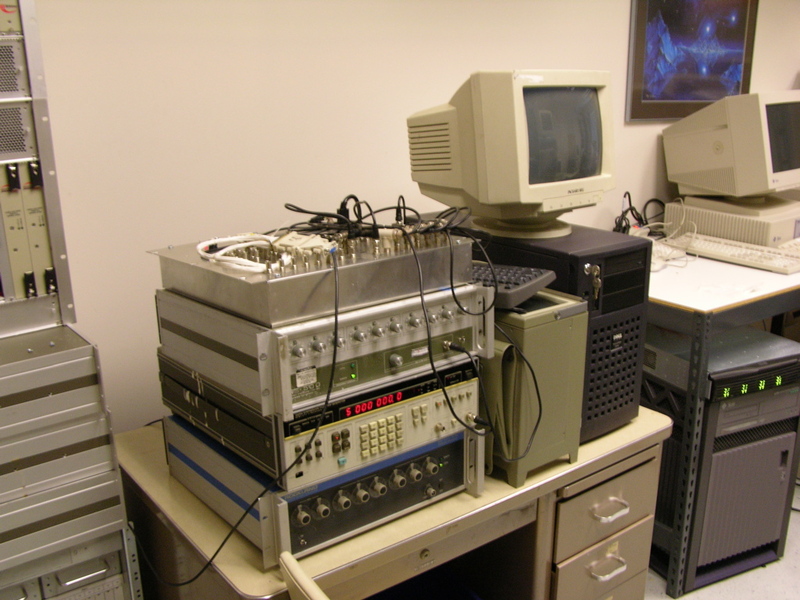 At this point in time, all final, reduced scientific products produced by SETI@home are sitting on this very machine (and we're busy merging it all into one, inclusive database). It's a busy machine. 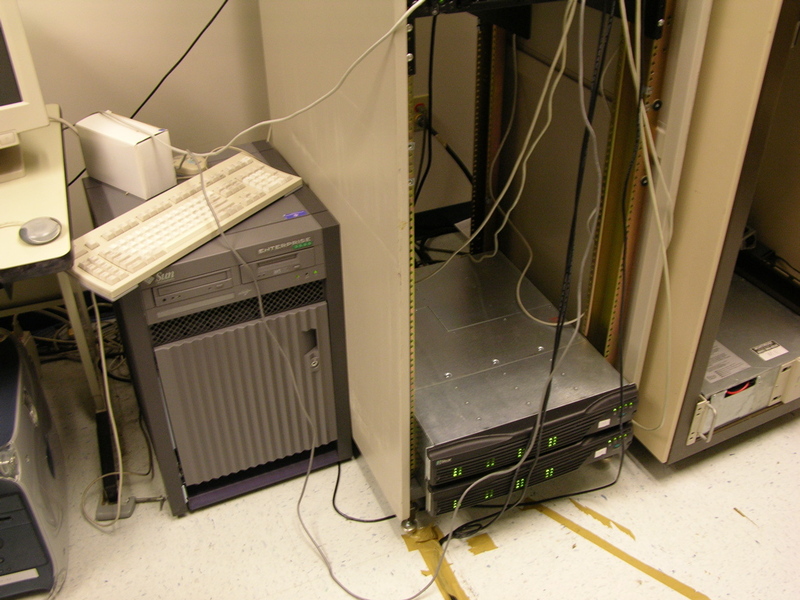 Here are another couple of servers of note. 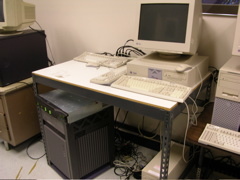 In the rack on the left is a Dell server running linux which hosts the boinc.berkeley.edu web site and BOINC alpha project, among other things. In the other rack is our Sun v40z dual opteron BOINC database server with a 3510 holding one terabyte of disks sitting on top. Moving on to the server closet, located across the hall. This tiny, air conditioned room holds everything else. 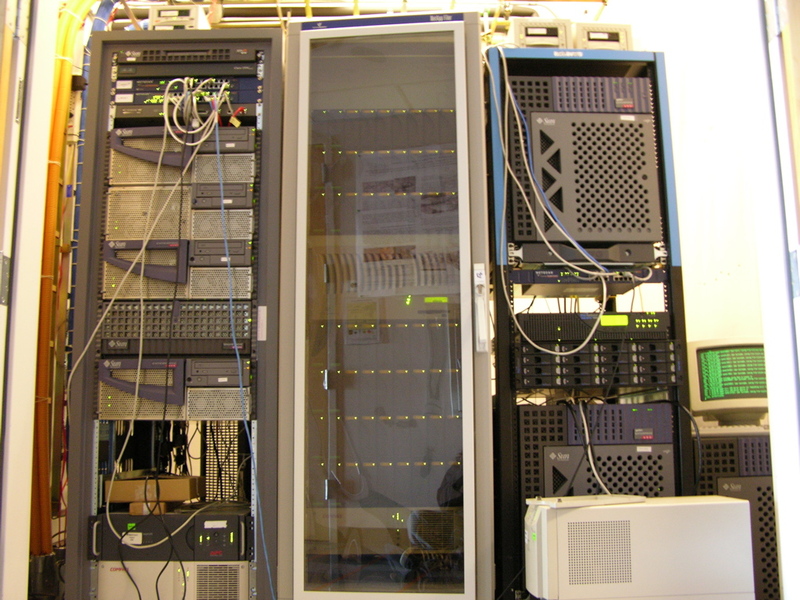 The leftmost rack has all our Sun D220Rs (mostly web and BOINC back-end servers). The middle rack is our 3 terabyte NetApp network attached storage (there's a whole bunch of 73GB disks in there). The rightmost rack has two Sun E450s (one is the SETI@home classic user database, the other is the classic "on-line" science database). In between the two is our SnapAppliance 18000 network attached storage (6 terabytes!). Off to the right side is another E450, which is the SETI@home classic data server. 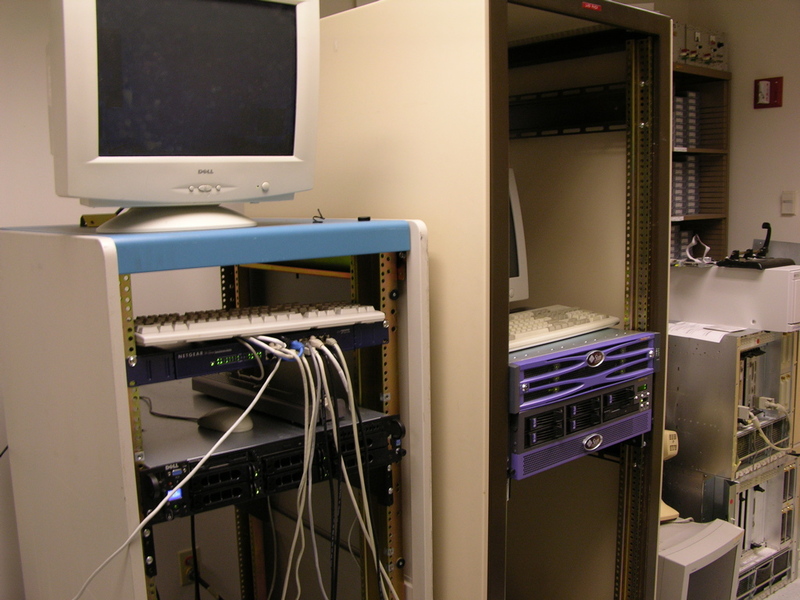 At one point in time that machine accounted for 33% of the entire campus bandwidth. We were then encouraged to get our own private ISP. Squeeze behind the racks and you'll find another E3500 with a bunch of A5000 storage arrays attached to it. This is the old SETI@home classic "master" database, now functioning mostly as the SETI@home/BOINC scheduling server. Here's the patio at the end of the hall where we have our meetings. Note the telescope that is hidden in the nearby trees about 200 yards away. It's not ours. Belongs to another project here at the lab. This is the view from the patio looking down at the nearby Mathematical Sciences Research Institute, or MSRI (pronounced "misery"). They've been working on their new addition for a while now. Below that is Oakland. I can see my house from here. Okay back to work.